This describes the large network of pipes I use to get the water to the collection tank. These are the pipes, one that takes water from the foundation and one that takes water from the gutters and decking. Whenever you bury pipes in the ground it is worth taking lots of pictures so you can remember where you put them. (The following pictures show a cleanout on the top drainage pipe but this was removed later because the catch basin provides the cleanout functionality). It is good to include a filter box inline with the gutter water. 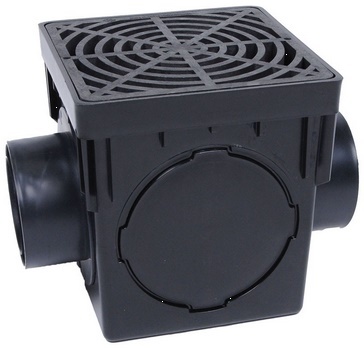 You can use a small catch basin and fit a rigid filter mat inside.